Bell, who has been specializing in "artistic animal imagery" for the past three years, was looking for new inspiration – hoping to create something striking. 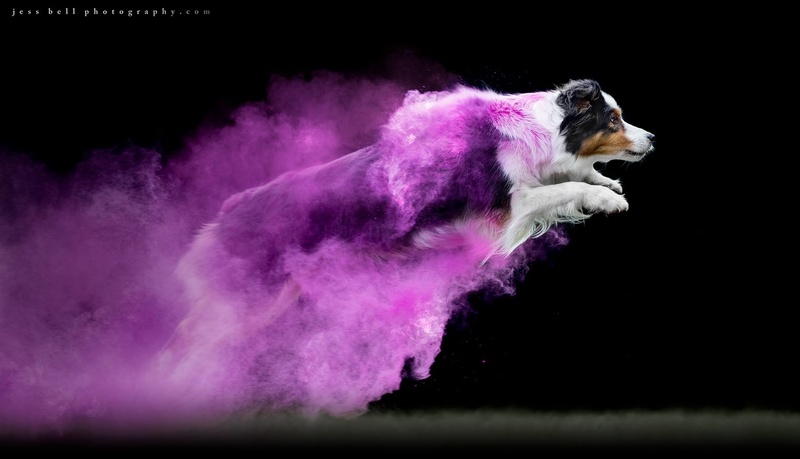 The concept she settled on involved borrowing friends’ dogs, whom she’d cover in colorful powder before having them jump dramatically through the air. 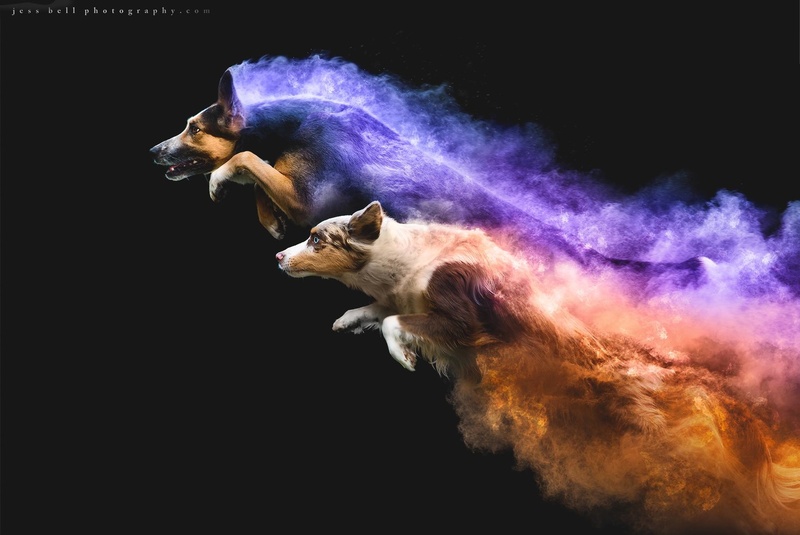 Featured in the series are breeds including Border Collies, Australian Shepherds, German Coolies, and more. 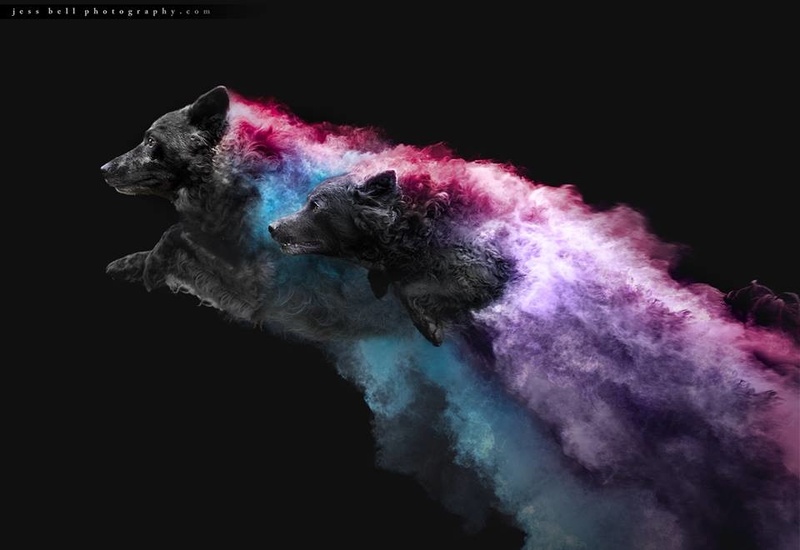 The images were created by placing colored powder on dogs owned by some very talented dog training friends (and my own dog). We then asked the dogs to move and capture the resulting explosion. Each image is unique as it reflects each animals’ individual movement and structure. Don’t worry, the powder is non-toxic (FD&C/D&C approved), we shoot with plenty of ventilation and it’s kept away from airways so nothing is inhaled. 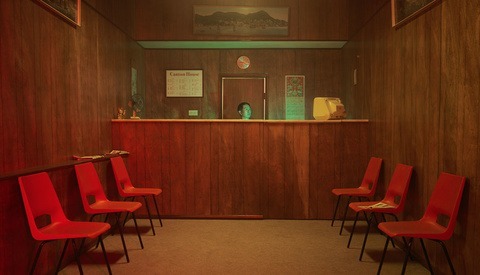 Bell credits the “wonderful work” of Andrea Zachrau as the inspiration behind the photo series. 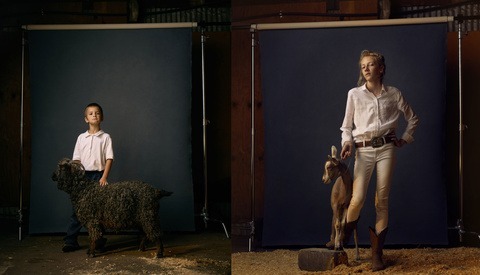 Zachrau is known for her creative and colorful images of equestrians. 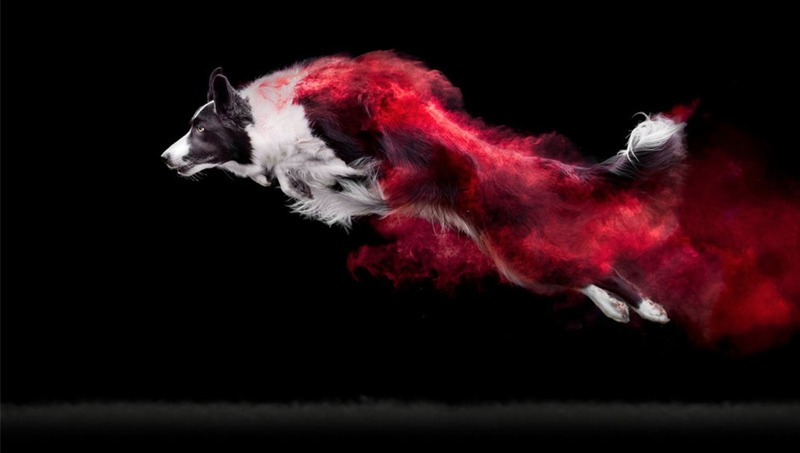 Of her favorite from the series, Bell ultimately landed on the photograph of Border Collie Rush jumping with red powder. “Black, white and red is a killer color combination, and I love how powerful his jump is” she said. 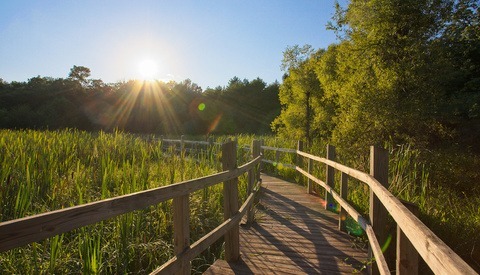 Images courtesy, and used with the permission of, Jess Bell. You can see more of her work at her website, Facebook page, and on Instagram. never in a million years would i have thought to do something like this, even being a dog lover. the results are simply awesome, in the truest sense of the word. Perhaps because the photo doesn't always accompany the title and that the goal of a title is not only as a summary headline but also as a mechanism for search engines to index the article without any knowledge or awareness of said cover photo. Furthermore, most journalistic headlines state the obvious. This is the purpose of a title, to communicate to the reader what they are about to read, often in incredibly simple terms so as to avoid confusion. A basic course in journalism and/or writing would teach this. But then again, I took a moment to visit your blog and quickly came across a post titled: "Egg Coffee" accompanied by a picture of egg coffee so it seems that the pot has met the kettle. Ryan, you have this brilliant first opening lines which is right and well written, then you end the post with "But then again, I took a moment to visit your blog and quickly came across a post titled: "Egg Coffee" accompanied by a picture of egg coffee so it seems that the pot has met the kettle." Which is pretty much a demonstration of the worst things about internet discussions, it is a petty and arrogant comment. As a Fstoppers staff writer, I hope you aim for setting a good example of how you want forum/comments to be, rather than a finger pointing and pettiness. There is nothing arrogant about it. I merely was pointing out that the commenter is responsible for doing the same the that he is complaining about. However, if you take it in context of the first two paragraphs my point is that there is nothing wrong with it. It is meant as irony. Ryan I think your headline is fine lol. Thanks for sharing. "it is meant as irony"
Ryan Cooper , you are the professional part - what you are doing here is promoting negative behaviour, you are effectively saying to people that "if you comment on our site, we think it is perfectly fine for us as a professional party - to view through all your data, pages and similar - until we find something we can use against you"
This is not good or healthy behaviour from a professional party. Calling it irony, does not make it better, it genuinely make it worse. I imagine we will just have to agree to disagree. I employed a perfectly reasonable debate tactic that is commonly used in many public and professional spheres. Regardless, I am comfortable and confident in my statement and stand by it. I also do not agree that it promotes negative behavior. It is completely reasonable to respond to someone claiming "You shouldn't do X" with "But you also do X, but X actually isn't bad because Y." I think you are missing the point, you crossed the limit when you visited the users blog, drawing it into a debate. That is unprofessional, it is completely besides the point. It is at the level of me going onto your private facebook page, looking for comments you may have made and use them against you. Except, you - as a Fstoppers writer are a professional party here, expectations to you are accordingly. I have never in my professional working life, ever seen anyone saying that it is acceptable to do so. I'm not going to keep arguing, it is pointless. I still disagree with you. I'd also argue there is a big difference between visiting a public facing branded website and hunting through private facebook comments. It is completely reasonable to hold someone accountable for what they have published publically. It is incredibly common in all forms of journalism for journalists to hold someone accountable for something they have said in the public sphere that is contradictory. Regardless, as aforementioned, this conversation is going nowhere. I wish you all the best. Ryan Cooper I wish you all the best, and hope that one day you will learn the difference between use of irony as a private person and journalism as a tool for making the world a better place, either through discovery, information or public discourse. As a PS. What if ever was the journalistic value with your original comment here. there's few things more sad than seeing someone claim to take the high road after getting their car stuck in the mud of the low one. you really should go back and read the comments in all of your other blog posts. you take the bait every time you get trolled. and i'm still unsure if it's sad or hilarious, though i'm leaning toward the latter as it always ends in the same way: you getting clubbed in the back of the boat while thinking you caught the boat. yes, and that "perfectly reasonable debate tactic" is called "false equivalency." you're comparing your act on a professional website to that on someone's personal blog. plus, if you're a "journalist," then you should know you cannot logically hold a non-journalist to a journalistic standard, especially one you yourself fail to meet by your own admission by using the false equivalency standard. this is also known in "debate circles" as the "i know you are but what am i?" tactic. The dogs look to me like their living their best lives. Looks like your a dog lover like me! I really like your photograph titled; What! Thank you William. Yes im a dog lover. I train protection dogs and photograph dogs of difrent breeds. 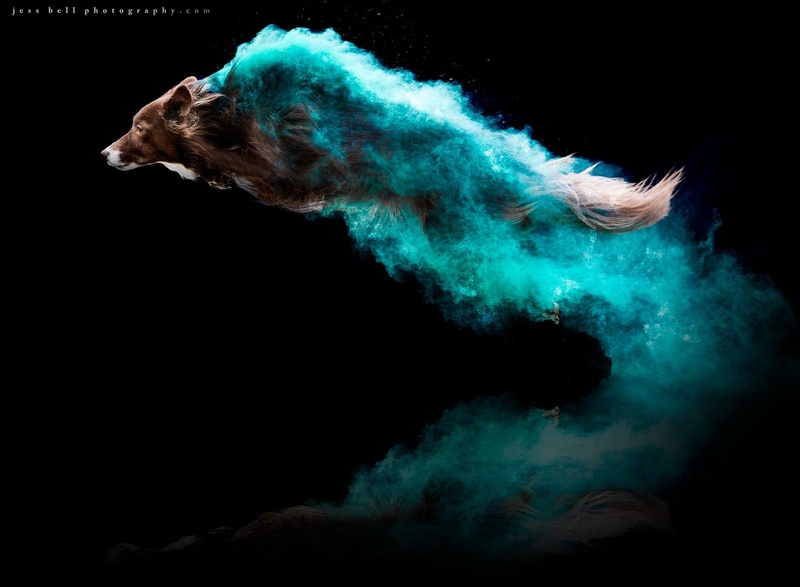 While I think the images are striking I also wondered what happens when the dogs breathe substantial amounts of this stuff in during their exertions and then lick it off themselves and how potentially toxic or non toxic it is? There are a number of brands of this stuff and if you Google "colored powders" and "toxic" there has been some concern about the content of some of these brands when inhaled by humans (and, obviously, animals too). From the article: "Don’t worry, the powder is non-toxic (FD&C/D&C approved), we shoot with plenty of ventilation and it’s kept away from airways so nothing is inhaled." No, dogs love this stuff, you know, they love having fun with people. I see your concern though, as a dog owner and friend to dogs. Holi powder is food based, and as far as I know, completely harmless which is why people don't get sick during color runs where they would be breathing in vastly greater volumes of the powder than the dogs likely would during a shoot like this. If you are curious Holi Powder is about 95% cornstarch and is then dyed with food and cosmetic grade dyes which are designed to be harmless when ingested or absorbed by the body.